But the company's report fails to consider the lack of safe bike infrastructure in the outer-boroughs. Is Uber going to pull an Uber on bike share, too? The company, which is lobbying the city to get into the bike-share business, says New Yorkers would take 1 million of their 26 million daily trips on dockless e-bikes — if (and it’s a big if) the city deployed 100,000 to 200,000 bikes, or roughly 10 to 20 times the current Citi Bike fleet. At the moment, the city only lets Uber’s JUMP Bikes and other dockless bike-share companies operate in designated pilot zones outside of Citi Bike’s exclusive center-city service area. 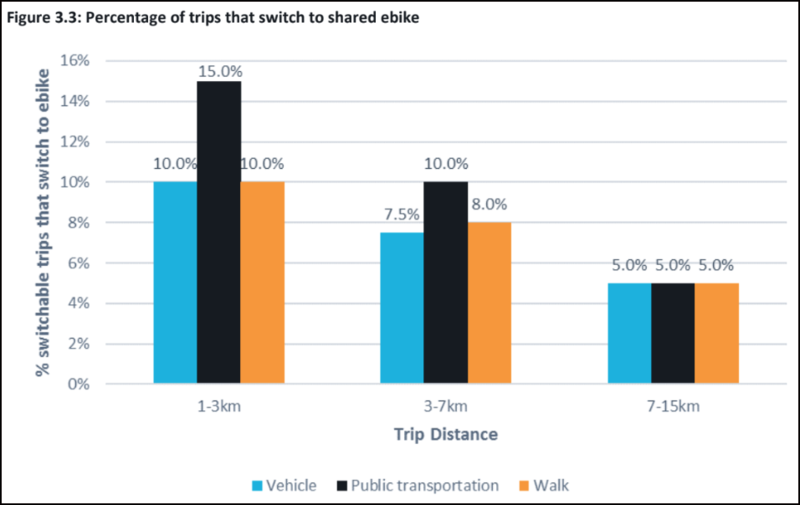 But an Uber-commissioned report by the Boston-based firm Steer suggests that those restrictions are preventing exponential growth in cycling — from just 1 percent of all daily trips to a possible 4 percent [PDF]. The report estimates that of the 26.4 million trips taken every day, roughly 10.3 million are “potentially switchable” to e-bike because they are made by foot, motor vehicle or public transit. That number gets pared further because some trips won’t likely be converted, such as trips by individuals who are too young or too old to bike, trips that are shorter than .6 miles or longer than 9.3, trips with luggage, and trips beginning or ending outside of the city. In the end, 1 million trips could be made on e-bikes — but here’s the catch: The city would have to let companies to deploy a whopping 100,000-200,000 e-bikes, the report claims. Of course, simply plopping tens of thousands of bikes — sort of the Uber approach to transportation — won’t have much of an impact without safe biking infrastructure. In other words, the report doesn’t account for the fact that in many of the corners of the city, streets aren’t designed for safe biking. New York City only recently legalized pedal-assist e-bikes, but they haven’t caught on in cities where they’ve been legal for longer — at least not on the scale anticipated by the JUMP/Uber report. JUMP is currently jostling with competitors for the right to bring even more bikes to neighborhoods outside of the current Citi Bike service area, where Lyft-owned Citi Bike operator Motivate has exclusive operating power. The Citi Bike system is popular, but has not expanded beyond Manhattan below 125th Street, the western edge of Queens and parts of Brownstone Brooklyn. The company is also just coming out of a crisis-level hardware shortage. In September, Streetsblog revealed that the company had less than 60 percent of its supposedly 12,000-strong fleet of bikes out in the field. Citi Bike’s limited pedal-assist e-bike pilot, consisting of about 200 bikes, has been popular, with e-bikes being ridden an average of 14 times per day, the company said, although those numbers are at least partially the result of scarcity. In a statement, Motivate spokesperson Julie Wood rejected the argument that it would take hundreds of thousands of bikes to reach one million daily rides. “We believe Citi Bike ridership would be much higher than this with a similar number of pedal-assist bikes,” she said. That’s a big claim from a company with ebikes in the dozens, not hundreds of thousands. If Citi Bike is really claiming it could serve 1 million trips per day all by itself, most cycling advocates would want to call that bluff and demand that the company, and the city, prove it. There’s an even bigger urgency than lack of bike infrastructure which has to be addressed before putting a few hundred thousand e-bikes out there, namely the building the charging infrastructure. Hint—manually swapping batteries isn’t going to cut it. It didn’t even work for a few hundred e-bikes. At some point that may be true. But in the short run, bikeshare is a natural monopoly, as defined by economists, and ought to be a regulated utility. If there were eight different companies, you would either have to pay all of them or accept that there might not be a bike from your particular company available. If you couldn’t count on bikeshare, you’d end up having to take some of the trips by, say, carshare. Oof. 200k electric bikes… I can’t even imagine how many battery-swapping gnomes it would take to maintain that size of fleet. Agreed. One beauty of Citibike’s pricing is how it encourages multiple short trips, IMHO, appropriate to urban living. Re: the elusive electric-assist CitEEEEbikes, thus far, I’ve snagged two. One ride included a segment on the westside pedpath into a significant headwind. You could have fooled me. These things take ten, nay, twenty years off your age. In a good way. Because my typical use is multiple short rides connecting errands, I doubt I’ll seek out electric-assist bikes, but I’m enthusiastic about the technology. If the goal is “more butts on bikes”, I think the electric-assist bikes are a bigger game-changer than bike lanes. Correct, the biggest failure with the JUMP system is the huge labor needed to keep them charged. A docked system, where docks are plugged into the grid, would allow bikes to charge every time theyre parked. Citibike’s docks are independent / free-standing. They’re solar / battery powered. They require and consume minimal power. Redesigning the docks to allow recharging electric-assist bike batteries could be done. IMHO, it would require connecting to the grid, hardly a deal breaker, but definitely a whole new deal. Yes!!! We need to start thinking about our transportation system like we think about sewers. It doesn’t make sense to have 8 companies laying down sewer lines on each street, so too does it not make sense to have 8 bikeshare companies provide duplicative bikeshare on each street. Lyft and Uber lose money on just about every ride. When you lose money on every sale you have a problem! The thing about “losing money” is that because of the tax code (“code” is unintentionally a superb word choice) there are lots of different ways to lose money. Some are bad; some maybe not so much. Uber / Lyft are hoping for magic. The infrastructure needed to support the car rides is massive. The net loss on each ride is greater than the revenue for each ride. And they’re already near their maximum market share. Uber and Lyft tried raising prices, but supply / demand stopped them – the current prices seem to be optimal. They tried screwing drivers out of some of the revenue, but they lost drivers – again, supply / demand at work. They tried “innovations” like shared rides, which failed to generate much interest. (Too bad, IMHO.) They hoped to wipe out taxis and other local transit and then use monopoly power to raise prices, but the problem is the entry costs for local car-based taxis are so low that they can’t keep a monopoly once they raise the prices. Self-driving cars could eliminate driver cost, but self-driving cars aren’t happening today. Or tomorrow. What excites venture capital about Lyft, Uber, Bird, and Lime — the magic — is harvesting, monetizing, and selling personally-identifiable user data — turning patterns of where people go and what they do into great marketing data. But “smart” phones already can do this. So that means Uber and Lyft have to find profits elsewhere. Uber and Lyft and Bird and Lime are rolling the dice on dockless bike share and motorized scooters. Apart from ranting, my concern about Uber / Lyft and dockless bicycles and motorized scooters is whether, because of the tax code, the costs incurred remain private and what will become a public burden. Additionally, and more profoundly important for livable streets folks: the arrogant refusal of Uber and Lyft and similar ventures to pay for the public resources from which they hope to profit. Specific to dockless bike share and motorized scooters, the companies behind these ventures assume they can store their private property on public sidewalks and streets at no cost to them with the entire cost shifted to the public. We learned that when we had multiple private transit providers duplicating services all over the place and making people pay multiple fares. But history shows that people have to learn the same lessons over and over. You could have battery-swapping gnomes swapping batteries at the charging stations instead of the bikes. Charge the bikes from those batteries. The Telecommunications Act of 1996 is perhaps a more telling example of lessons not learned. For wired, instead of a regulated monopoly we got a de facto unregulated monopoly. Got Fios? I have DSL that doesn’t work in the evening for more than one person. They say no one is willing to provide access from the street to the back yard, where the poles are, but when I showed them a route under my house they didn’t want to take it. The other choice is Spectrum, which Cuomo wants to kick out of the state. I’m personally fine if the city repurposes parking spaces for bike share docks. That serves a positive public purpose by helping discourage car ownership. It can also make streets safer by daylighting corners. Yes and yes; I agree. The more bikes on the road the better. Even if they are e-bikes. Even if it results in some chaos and clutter on the sidewalk. Much more safe bike infrastructure needs to be built in NYC and the greater the number of cyclists, the greater the pressure to build that infrastructure. Maybe the calculus is different for bike share, but in general I’ve always walked if the trip is 3 miles or less. Lack of safe bike parking often factors into that decision. However, even with bike share, unless I had an annual membership I would probably opt to walk on any trip under about 3 miles. It’s much the same calculus as I make when deciding to take a bus. Not worth paying a fare to save at best a few minutes (plus I could use the exercise anyway). If I’m going to bother to bring my bike up from the basement, I’ll usually be riding it at least 10 miles. Of the systems that I’ve used (Citi Bike & Ford/BABS), paying for single rides would be unusual. Citi Bike didn’t even have a way to sell you a single ride until, like, 18 months ago. create parking for them in the street, not on sidewalks. Yes, thousands of street corner in NYC need bulbouts anyway. It’s stunning how much space is simply wasted. That would provide plenty of space for bike parking, sidewalk cafes etc, and make the city safer. There’s no shortage of people in NYC, but there is a shortage of street space. You are exceptional in many ways, Joe. 🙂 I bet the overwhelming majority don’t like to walk 45 minutes just to get somewhere. I don’t know what would be representative of the population, but just to trade anecdotes: I would ride my bike instead of walking for trips of 1.5 miles (sometimes even 1 mile), and bikeshare for 0.5 miles. What Happens When a Company That Sells Car Trips Gets Into the Bike Trip Business? Lyft has acquired the nation's largest bike-share company, setting up a situation where its bike trip sales will cannibalize its car trip sales.